When a five minute clip of the film was released, Joss Whedon criticized the film for have “70’s era sexism,” and while the clip was a tad off putting due to trite and awkward banter, I thought Whedon was off base and should have tread more likely as someone who regularly, and wrongly, gets the prejudice label thrown at him. However, after seeing this film, the accusations have far more weight than I would have ever expected. I won’t waste time by naming every problematic occurrence or even trying to make certain things issues where they are obviously not (ALL THE DINOSAURS ARE GIRLS!!! ), I do hope to outline some of the perturbing dynamics throughout the run time, which are devoid of a legitimate counterbalance. The dynamics between men and women in this are fraught with glorification of men and contempt for women. Frequently, the teen character gawks at every girl around him yet rejects the girl who claims to “love him.” Alone, this is hardly an issue, but when combined with Dallas Bryce Howard’s character, Claire and the treatment of other woman. Claire, being the most prominent character in the film, is portrayed in cliched “ice queen” fashion, defined equally by her controlling and cold personality as by her high heels. Her character arc has the appearance of following in the same vein of other great women characters, such as Ripley or Sarah Connor, but upon closer inspection, everything she does is either passive or in response to what a male character tells her to do. Even her “save the day idea” is essentially handed to her by her nephew. All other actions that display strength are equally inspired by Pratt’s Owen, who even bestows upon her a kiss in thanks for her saving him. This bit of affection in stark contrast to his reasoning as to why they did not date, in that she’s too controlling. She also has issues with family. The pessimist in me wants to say that it’s highly critical of her refusal to have children but I’ll give it the slight benefit of the doubt that it’s merely saying she needs familial intimacy, it putting her life choices in a highly negative light on this issue while not judging Owen by even close to the same metric is indicative of outdated gender ideals. Where are the people telling Owen he needs to stop messing with dinosaurs and get a family? The scene that embodies this films problems with women is in the fate of Claire’s assistant. The worst thing she’s done is be mildly negligent of the boys, who behave in a manner that would place them in a “far more deserving of dino chow” list if there’s ever been one. Yet, the film gives her the most grisly death in the entire franchise. I won’t describe it, but its a jaw dropping sequence that feels out of place in a film relatively devoid of cruelty, even granting it’s villain a relatively quick off screen death. I’ll cease my gender rant and try to avoid preachy. These issues are far from the only ones in the film. This is a franchise plagued by a complete lack of logic and strange technical issues, such as the most mind boggling continuity errors I’ve seen (WHERE DID THAT CANYON COME FROM IN JURASSIC PARK? 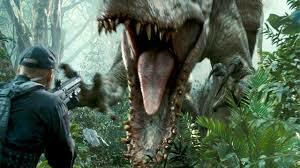 THE GOAT AND TREX WERE JUST STANDING THERE?!?!?!). With that in mind, especially as I am a fan of the franchise, it would seem disingenuous to tear this film apart over all of it’s plot issues or thin characterization. If the previous films didn’t lose you, (which really, if the first one didn’t lose you, the others shouldn’t have) then this one shouldn’t be any different. I would never advocate turning your brain off, nor do I feel it’s necessary for this one, but merely advocating an extraordinarily high suspension of disbelief as this is all mere pretense for having dinosaurs bridge 65 million years of separation with teeth and claws. To put it simply: the movie, by a standard of plausibility and logic, is dumb. Just like Jurassic Park is dumb. That said, it doesn’t veer into Michael Bay territory in regards to plot and character, they are serviceable for getting us to see dinosaurs. It’s strength lie in the subtext of the film and how it functions as a slight criticism of the blockbuster and the plight of carrying on an old franchise. How do you surprise an audience that has already grown comfortable with the spectacle one has to offer? This issue, faced by the theme park is also that which Trevarrow and company faced in making this movie. The boredom of seeing more dinosaurs and new special effects is fairly well embodied by the disinterested teen, and the new spectacle of the hybrid Indominus Rex exists both to give bored audiences, real and within the film, new thrills. For the most part, it succeeds. The scenes lack Spielberg’s sure hand and ingenuity but they are often visceral and wear their influences on their sleeves, in particular a scene that evokes the processing station sequence in Aliens, which only adds to the metatextual nature of the film’s commentary. The only real weakness to this aspect is that it doesn’t appear to be fully realized or present enough to offset the drawbacks of an oversaturated genre. For instance, the film mocks product placement after Claire sells the presentation rights of the Indominus Rex to Verizon Wireless. Jake Johnson’s character remarks that they should simply allow the sponsors to name the dinosaurs after themselves. It’s an amusing scene but does little to reduce the endless onslaught of Mercedes product placement that is nigh omnipresent. Still, all these issues (and successes) aside, the film has moments of capturing both the grandeur of seeing these dinosaurs again as well as an accurate depiction of being at a theme park or zoo. Long lines, inability to see the attraction due to crowds, and teens constantly on phones are captured with equal attention to detail as the fantastic moments of seeing the dinosaurs simply being dinosaurs. This coupled with the very entertaining action/attack sequences provide the film with its saving grace. On that note, the film is not unlike going to a theme park. A lot of it is tedious and frustrating but ultimately, the thrill of the rides make it worth the price of admission. This is a good film and a worthy entry to an equally good franchise (I’ll make a case for Lost World and III if I have to!). And them dinosaurs was awesome. This entry was posted in Action, Horror, Recent Releases. Bookmark the permalink.